anxiously beginning my last semester before graduation. So much has happened since then that it feels like the beginning of the year was a lifetime ago. At the beginning of my Senior Year, I thought that I wanted to become an Elementary School Teacher, but then I fell in love. While doing some research for one of my history classes, I visited Historic St. Luke’s Church for the first time. The historic site was beautiful, the surrounding cemetery was peaceful, and the staff welcomed me with open arms. I was smitten. I think it was that first day, when I first visited Historic St. Luke’s, that my path changed. By the end January 2016, I had been offered and accepted an internship at Historic St. Luke’s Church. My internship involved a whirlwind of learning. I had no idea how much work went on behind-the-scenes at small museums. I learned about archives, artifact care, the history of Historic St. Luke’s Church, the Anglican Church, and more. It was a whole new world. 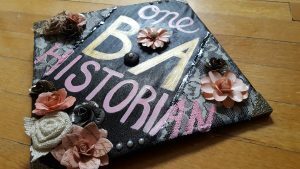 By the time I graduated in May, I had made it clear that I was planning to work in the Public History field. 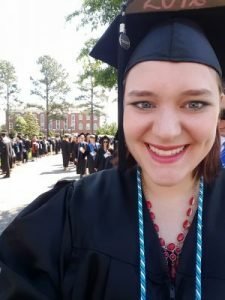 Luckily for me, I was offered a full time job at Historic St. Luke’s Church that I began only a few days after my graduation. As the first Volunteer Coordinator of Historic St. Luke’s, I worked to build a volunteer network from scratch with some success. Today, we have quite a few dedicated volunteers and the group continues to grow. Near the end of May, I was promoted to the position of Education Coordinator. As the new Education Coordinator, I was amazed by the plethora of responsibilities that fell onto my shoulders. 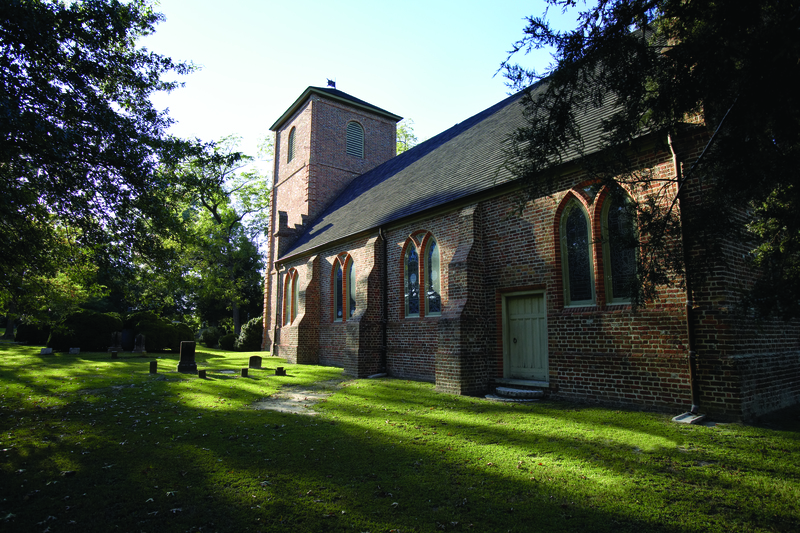 Our Mission Statement states, “The Mission of Historic St. Luke’s Restoration is to preserve, protect, and promote this historic church landmark and its collections, documents, history, graveyard, and surroundings.” As the head of the Education Department, I was now responsible for the preservation and protection of the historic church building, collections, documents, history, and graveyard. 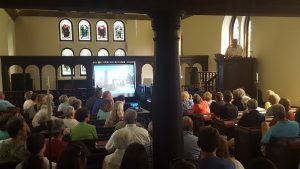 It was also now my job to plan and execute educational events and lectures that would encourage visitation and continued interest in the history of Historic St. Luke’s and the surrounding area. The events for the calendar year had been previously planned so I simply had to expand and execute planned lectures and events for the year. Ironically, the first guest speaker that we hosted after my promotion was actually a professor from my college whose class I had attended Freshman Year. Dr. Amanda Herbert gave an interesting presentation on the dynamic relationship between the Church of England and their nonconformist and dissenting neighbors in Virginia and Maryland on Saturday, June 4th. The symposium was thought-provoking and Dr. Herbert kept the audience interested and engaged for the hour-long lecture. At the end of the day, I felt like I was on top of the world. My first event as Education Coordinator had been a success and I was excited for the months to come. Many lectures followed this one, each one just as fascinating as the last. In August, Stephanie Anne Seal Walters, Ph.D. student at George Mason University, presented on the impact of Loyalist clergy on the Church in America and the fight for Independence in her symposium, “God Save the Kingdom: Loyalism & Ministers in Revolutionary Virginia”. 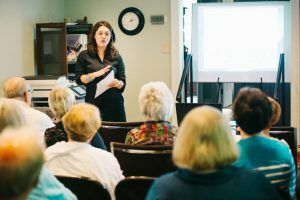 In October, as Hurricane Matthew rolled into town, Ms. Cohen Adkins of the Chickahominy Tribe braved the weather to give a presentation entitled, “Anglicans and the Native Peoples of Virginia”. 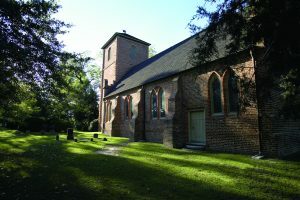 Her lecture explored the complex relationship between the Native Americans of Colonial Virginia and the Established Church of England. Also in October, we hosted what was perhaps our biggest lecture as there were 2 guest speakers and lunch was provided. Nick Luccketti discusses archaeology at our symposium. Nick Luccketti of the James River Institute for Archaeology and Bly Straube, Independent Archaeological Curator and Material Culture Specialist, both presented in our “17th-Century Archaeology Symposium”. Mr. Luccketti went first, presenting on archaeology completed at the sites of 2 of Isle of Wight County’s earliest settlers, Giles and Anthony Jones. Following lunch, Dr. Bly Straube gave a detailed lecture entitled, “Dutch Treats: Archaeological Evidence of the Dutch Trade with 17th-century Virginians,” which focused more on material culture, one of her specialties. Harmony Woods, a local catering business, provided delicious boxed lunches. The day was a success with many familiar faces in the audience as well as new attendees who will hopefully continue their interest in our Lecture Series. The last symposium of the year was November 12th. 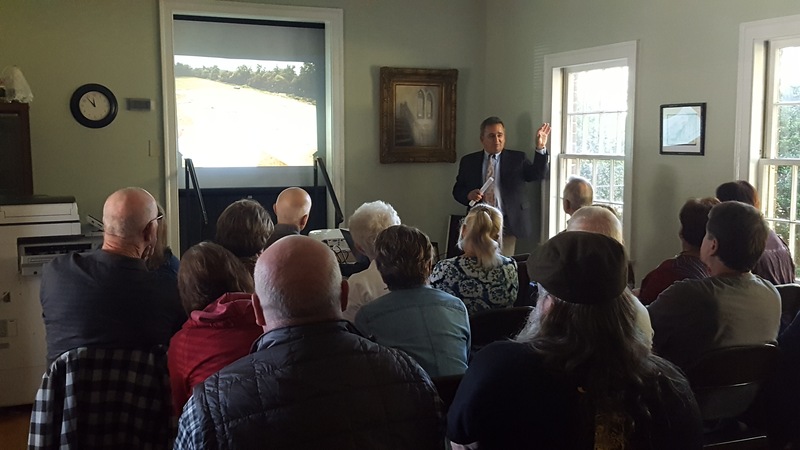 Dr. Randolph Tuner gave a captivating presentation on Werowocomoco, Powhatan’s primary residence in 1607 which Turner helped discover. Living historians at our 17th century event weekend. Perhaps my biggest challenge as Education Coordinator in 2016 was planning and holding our first annual 17th-Century living history weekend, “General from Whitemarsh: A Celebration of Joseph Bridger: A 1680s Living History Weekend”. Dr. Doug Owsley presents during the 17th century event weekend. That night, the Locrian Consort held a period-appropriate concert in the church building. I will admit that I was a bit concerned that I wouldn’t like the 17th-century music but the concert was actually the best part of my weekend. Dru Stowe was an entertaining speaker who introduced each instrument his group was going to play with amusing whit. The Locrian Consort, despite the often odd sounding instruments they were playing, made beautiful and sometimes laugh-worthy music. One of the instruments they played actually sounded like a duck. Imagine a group of ducks quacking in harmony… it was hilarious. 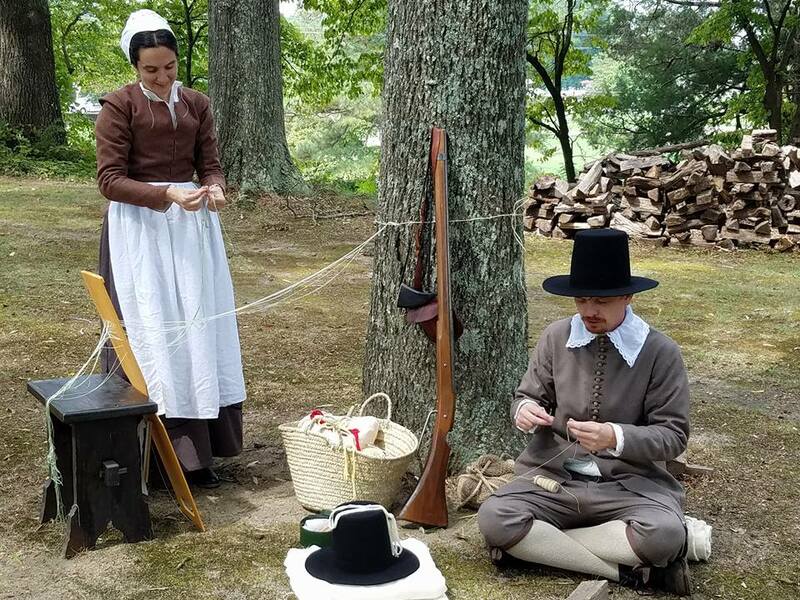 If they grace us with their presence at the second annual “General from Whitemarsh: A Celebration of Joseph Bridger: A 1680s Living History Weekend”, you should definitely check them out. I had a great time. After the concert, the last activity of the night was our first ever Twilight Cemetery Tour. The tour was given by beloved local, Kathy Mountjoy, who you can often find giving tours of Ivy Hill Cemetery in Smithfield or behind the counter at Smithfield’s Visitors Center. She kept her group entertained, interested, and laughing as she imparted the history of some of our cemetery’s residents during a very dark trek among the tombstones. This tour was a kind of preview to the Historic St. Luke’s Development Department’s Twilight Cemetery Tours that were held in October, of which Kathy Mountjoy was a part of. The Twilight Cemetery Tours were an absolute hit and I suspect the Development Department will be hosting even more interesting tours come October 2017. The morning of Sunday, September 11th, the last planned event of the weekend occurred in the church building. Brett Walker, Shoemaker for Colonial Williamsburg, showed off his impressive acting skills as he played the role of a 17th-century Anglican Clergyman. Mr. Brett Walker performed wonderfully, giving a shortened sermon from the time period, Old English and all. I will admit that the 1680s Lay Church Service reminded me of how thankful I am for my Religious Freedom. I continue to be grateful that I didn’t exist in Virginia during the 17th-century where I would have been forced to attend the incredibly long Anglican Church Services of the time period. Overall, the weekend was a success that I look forward to continuing to improve upon in 2017 when we hold the event again on Saturday, September 10th. 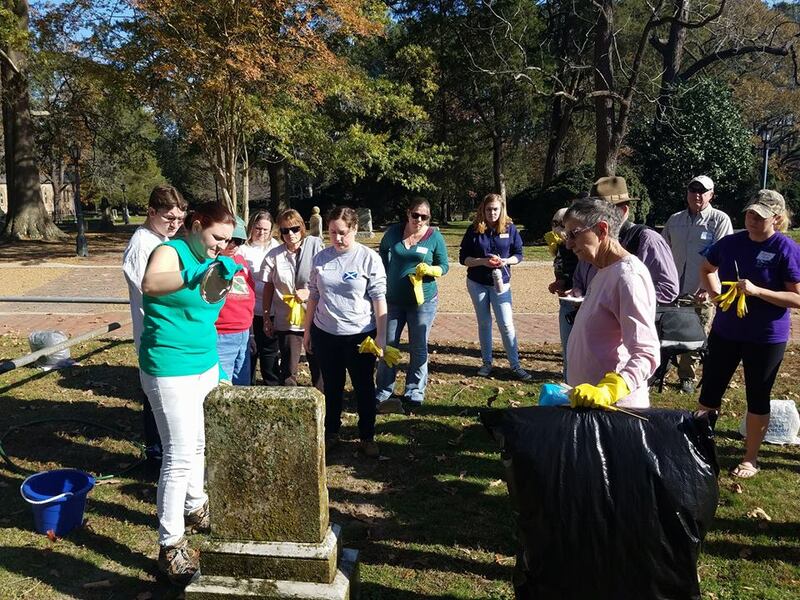 Volunteers gather around a grave during our cemetery preservation workshop. Looking back on the year, I am amazed by how much I have learned and how much my department has achieved. In the past few months, we have begun many large projects that will likely take a few more years to complete. The most notable project is the cleaning and preservation of our historic gravestones for which the Development Department raised funds for through the Twilight Cemetery Tours. During the month of November, we had our first Cemetery Preservation Workshop where volunteers learned how to properly clean these historic stones as we taught them, in a hands-on class, what we learned by attending a Virginia Department of Historic Resources course on the subject. Watching the volunteers passionately begin work on the cemetery cleaning that will likely take 4 years to complete was inspiring. This is a project close to my heart. The volunteers completed roughly 10 gravestones of the over 650 in the cemetery. We have gotten off to a good start and I look forward to holding more Cemetery Preservation Workshops in the Spring, after the weather has warmed up. After Dr. Randolph Turner’s symposium, the last Education Department Event of the year, I finally had the chance to take a deep breath and begin finalizing plans for next year’s Event Calendar. Be sure to keep an eye out for our 2017 Calendar as we have another exciting year in store for you! Historic St. Luke’s is closed for the month of January but I will continue to be hard at work planning Education Events for the upcoming year and continuing some of our behind-the-scenes projects like the organization and future digitization of our archives. The Education Department at Historic St. Luke’s wishes you and your family Happy Holidays and a Happy New Year!